After playing more and more with the Logitech G13 I have grown accustom to having the movement keys on G4 and G10-12. 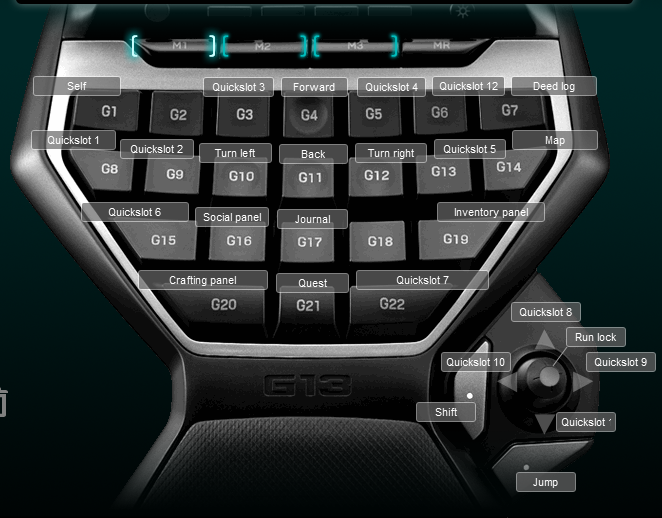 The Lord of the Rings Online Logitech G13 Profile I had created originally used the joystick for movement. I find this pretty difficulty to control in game. So I made the Lord of the Rings Online Logitech G13 Alternate Profile. This one the movement keys are G4 and G10-12. I put the shift and ctrl keys on my mouse buttons as well. Below is a screenshot of the keyboard layout.